Your wedding day is meant to be one of the best days of your life, as it is the day you get to marry the love of your life and mark the beginning of the rest of your life together. The actual plan for the wedding day was to entertain guests with food and dancing alongside a Harry Potter theme. With both the bride and groom being huge Harry Potter fans, they felt it fit to plan their special day around their favorite book turned movie. From Honeydukes candy bars, to the bride’s bouquet being made out of pages from the books, the Harry Potter theme for the wedding was set to be the couple’s dream come true. 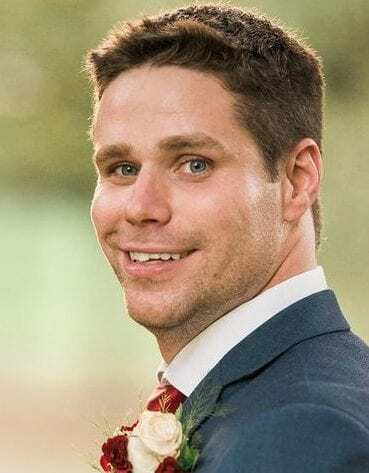 Having created a wedding website leading up to the big day, Brittany and Clayton chose to provide their guests with an outline of their seven-year romance. 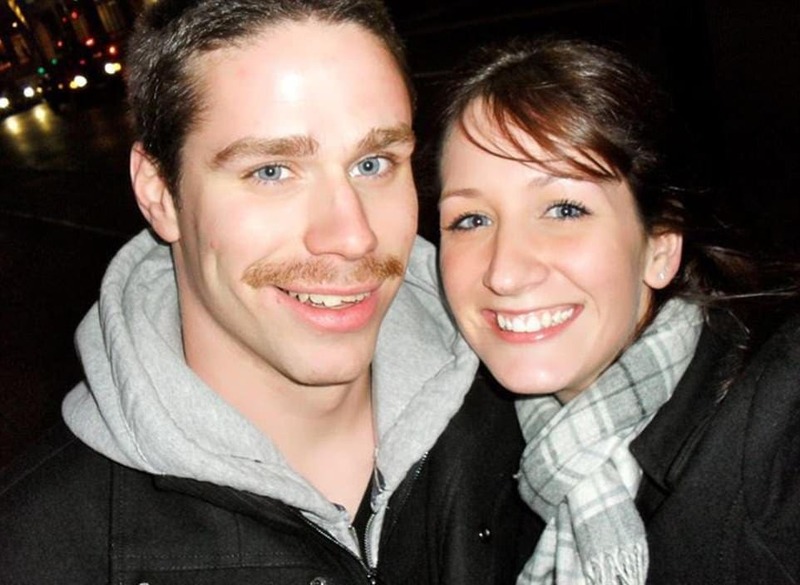 After first meeting in college in Canada, their wedding day would mark the 15th chapter of their story so far. 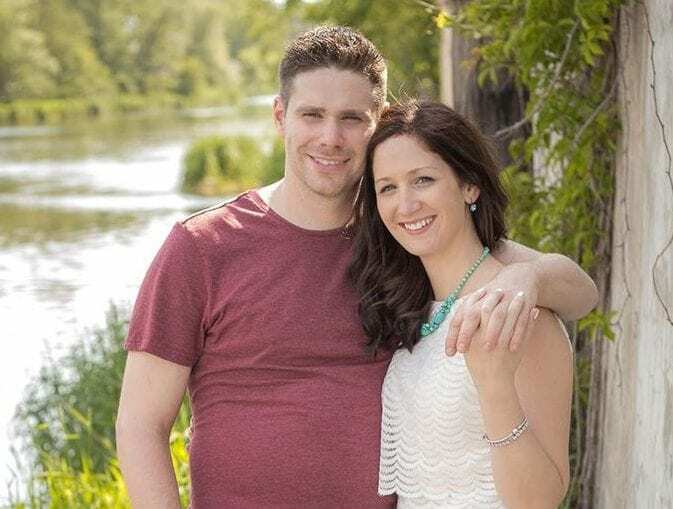 The pair were now looking forward to all the exciting experiences they would embark with one another after their wedding day and the chapters to come during their lives together. 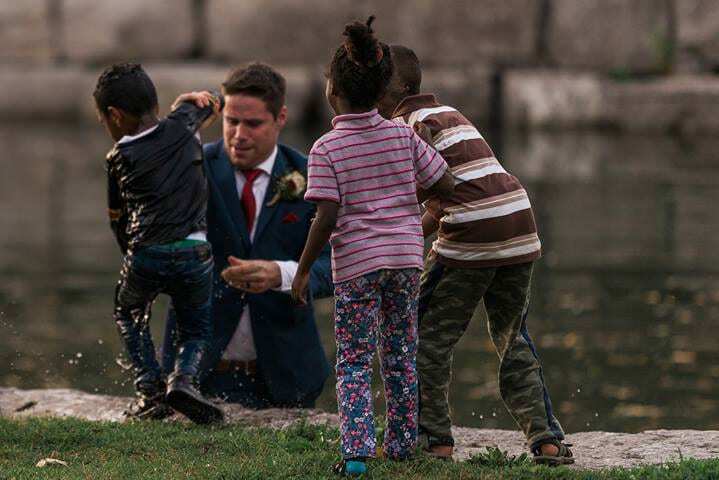 It was while they were taking their photos, however, that Clayton jumped into the river and was half-soaked, leaving both his new bride and the cameraman in shock. His actions happened to be an act of selflessness, a trait his bride has commended him for and noted as the reason she is so in love with him. So, while she was having her solo photos taken, her husband was proving why he was the right man to marry. 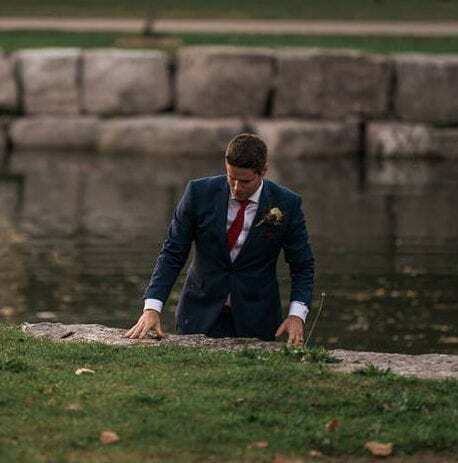 While this move of Clayton’s would definitely not have been on the wedding day agenda, especially when his suit was now drenched in water, his move has been seen as an act of heroism. What’s more? 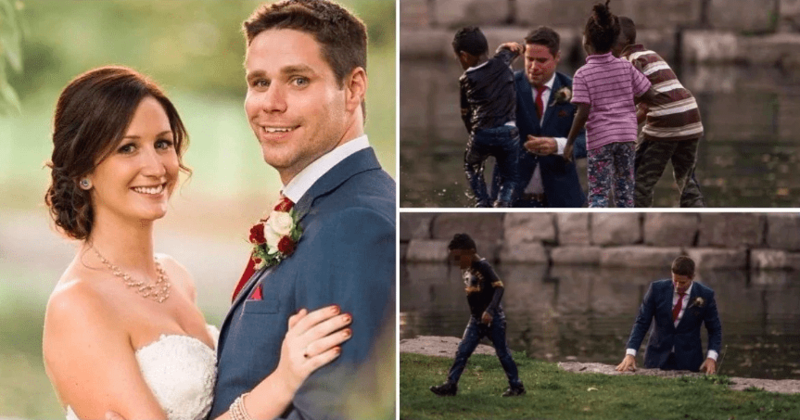 Clayton’s act of heroism has not gone unnoticed, and the couple has even been rewarded for this moment that took place on their wedding day. This unexpected moment has gone viral on social media, with many commending Clayton for his quick thinking and act of kindness. Once officially married, and having exchanged their vows to one another, the couple went to take their photos. 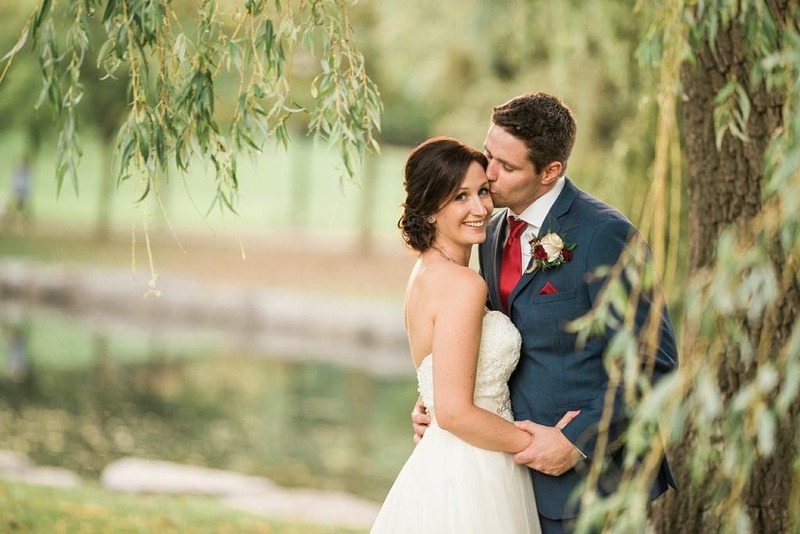 The bride and groom were accompanied by just their cameraman, Darren Hatt, and together they went to Victoria Park lake for the beautiful surroundings and photo-worthy location. 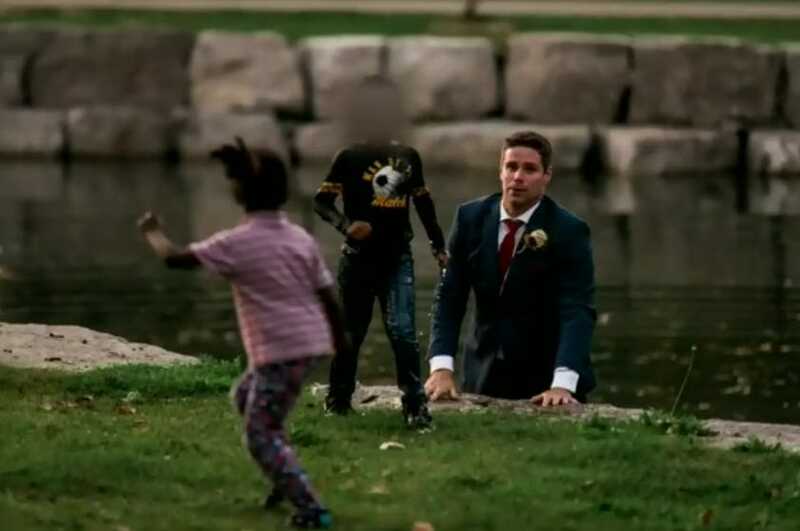 They were not alone since there were three children in the park laughing and playing with one another, and excited to see the happy couple when they arrived. Clayton’s instinct, however, was to keep a close eye on these children. Everyone wants their wedding day to be the most special day, to reflect the same hope for your future. 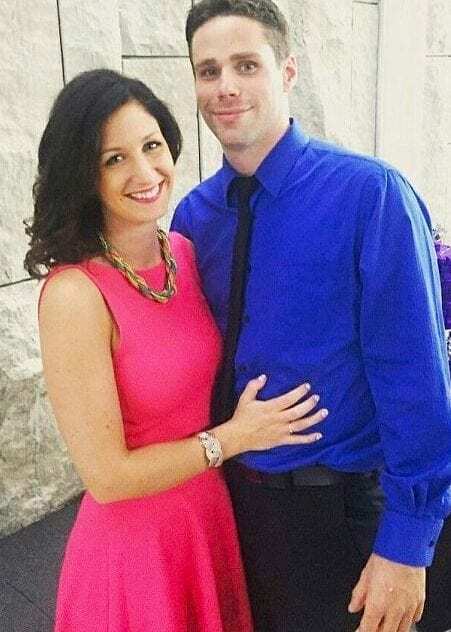 So, when newlyweds Clayton and Brittany Cook celebrated their wedding day, neither of them were expecting for anything to go unplanned. 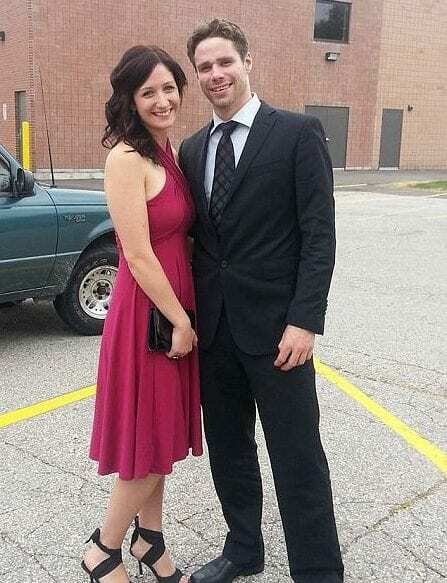 The happy couple got married on September 22, 2017, at the Victoria Park Pavilion in Kitchener, Canada, and the event was nothing out of the ordinary. The bride was glowing in a traditional white dress, and the groom wore a dark suit with a red tie. Their huge smiles from the photos spoke volumes as to how happy the pair were to have their big day arrive, to finally get married and commemorate their love for one another by making it official. “I was sort of keeping a close eye on them, just because they were close to the water,” Clayton told the BBC. A good thing too, because when Clayton next looked over, he only spotted two out of the three children standing over the water. 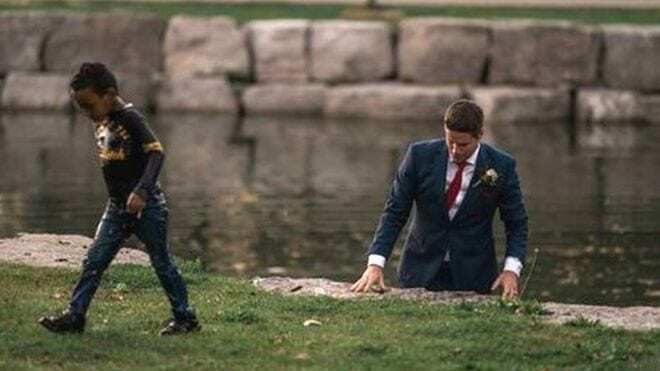 While photographer, Darren, was taking solo photographs of the bride, Clayton ran over to the water where he found the missing child in the water, and it was clear the young boy was in trouble. This was the moment Clayton took action to rescue the child in danger. However, the ever so humble Clayton played down his heroic actions when discussing the events that took place. 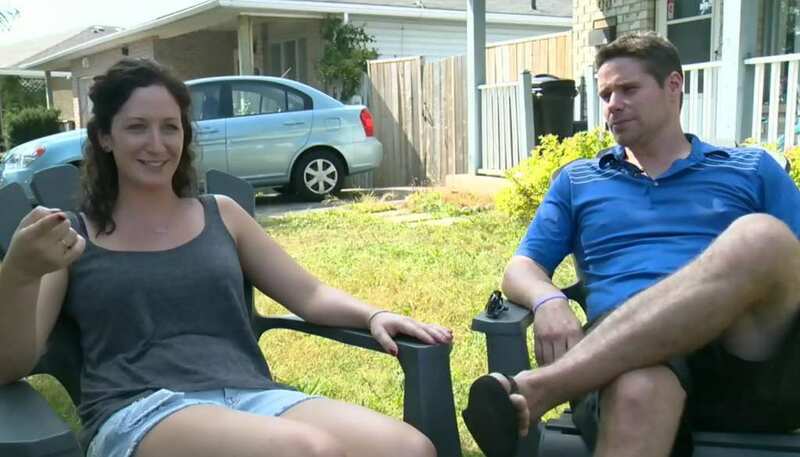 He told CTV that “his face was underwater and he was fighting, like he was really fighting. Luckily, he was only a little guy… and I honestly just sort of hopped him up.” Regardless of how little or much he helped, his quick thinking did not go unnoticed. Describing what happened, Clayton had gone over to the boy and told him, “Grab my hand, grab my hand.” It was clear that the situation was more serious and Clayton then got into the water himself and “plucked him out and put him on top of the ledge there.” Meanwhile, his bride was being photographed close by and thought her husband jumped in the water as a joke, prompting her to shout, “What are you doing?” At this same time, their photographer turned to capture Clayton. Photographer Darren was able to work in the moment and continued to capture Darren acting as a real-life hero. 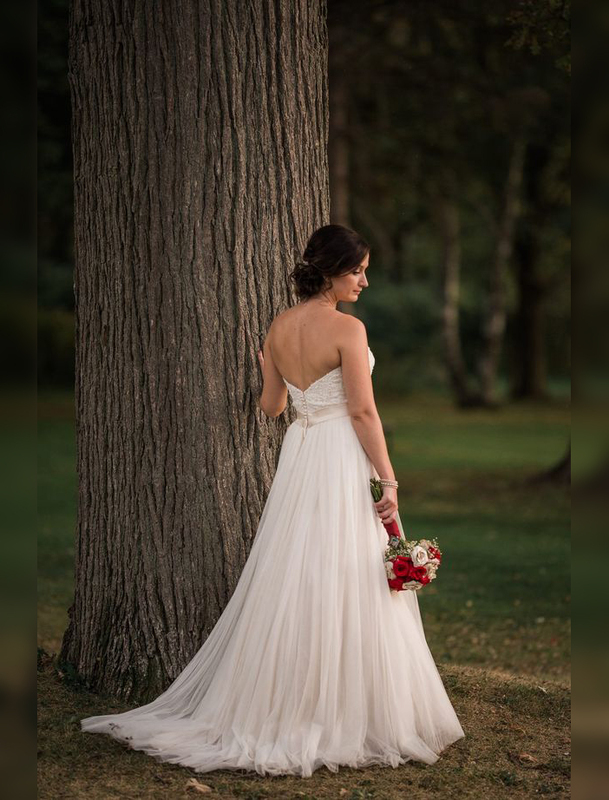 In fact, the bride had one request when finding a photographer and that was their ability to capture candid photos. Well, Darren was sure to show off his talents and prove to Brittany that she was right when choosing him for the job. These are the same photographs that soon went viral across social media and won the hearts of viewers worldwide. Fortunately, after all the chaos, the boy in question was okay but in a lot of shock. Clayton said, “He was probably pretty tired. I think he was fighting for longer than I even thought.” Nevertheless, the boy walked away without uttering a word to Clayton and continued to play with his older sibling. Meanwhile, the groom was due to greet his guests at his wedding party. The only problem now was that he was soaking wet, of course. The reason for his soaking wet attire was worth it, and Clayton, along with his bride, enjoyed the rest of the wedding day as planned. It was the following day that Darren decided to share his photographs on his Facebook page from the wedding he was hired for. 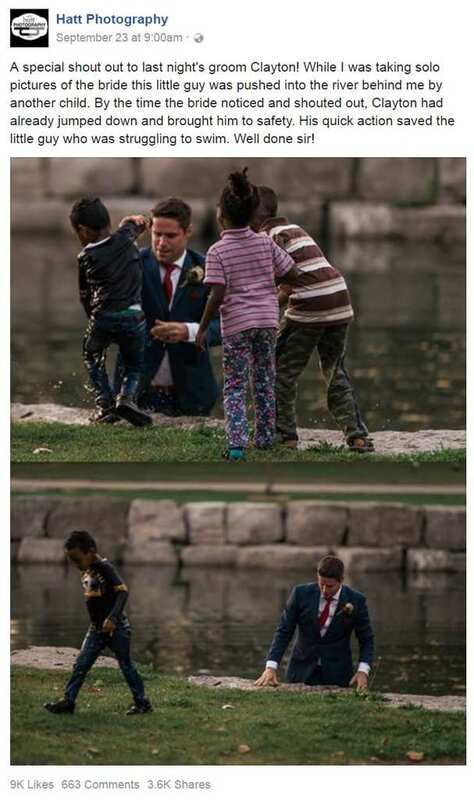 Although these were not your typical portfolio portraits from a wedding, Darren had good reason to let the world see the moment Clayton had “saved the little guy” at his own wedding. Putting aside his photography talents, Darren wanted to show off the quick thinking and heroic actions of Clayton. From this post, the world got to see the moment the young boy was saved, and Clayton became an online sensation. The post has gained over 3,000 shares and 12,000 likes, alongside many comments hailing Clayton as a hero. 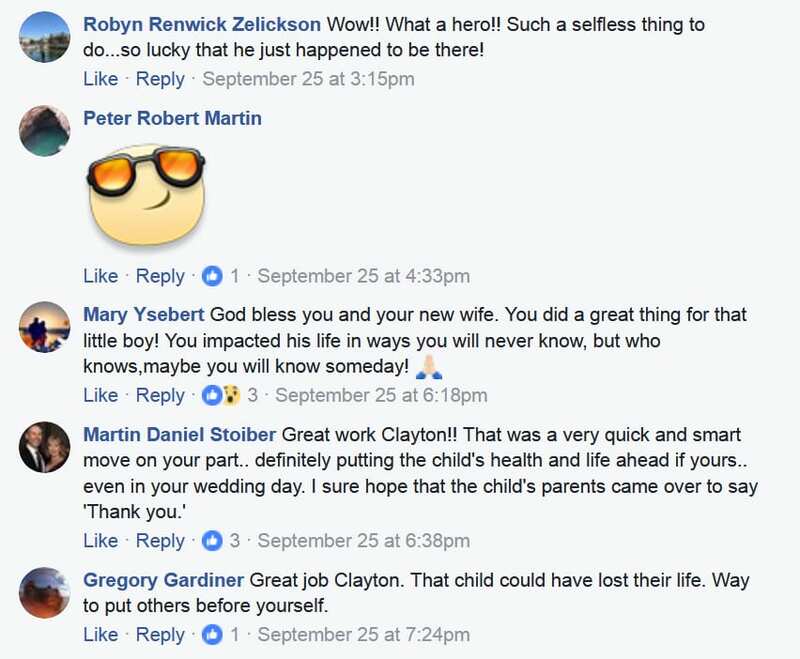 Staying humble once again, Clayton has said the responses to the post have been “crazy,” with many thanking him for saving this boy’s life. 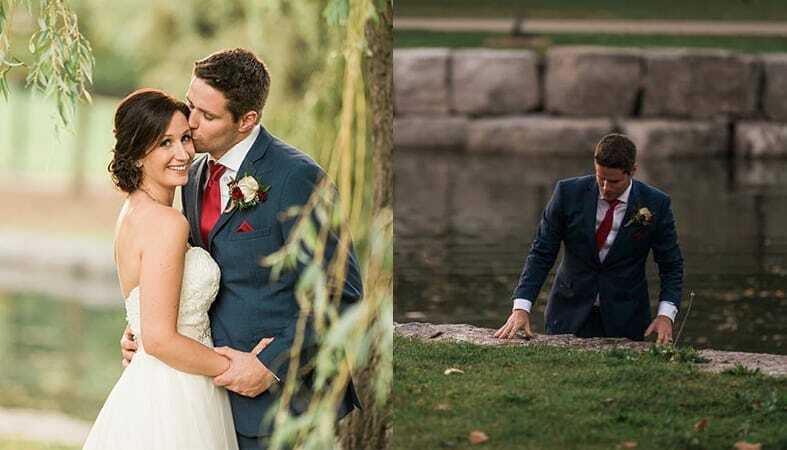 While the world commended the newlyweds for their role on the biggest day of their lives, Clayton failed to recognize why he was such a hero, and Brittany reiterated that her husband jumping in the water was a no-brainer. 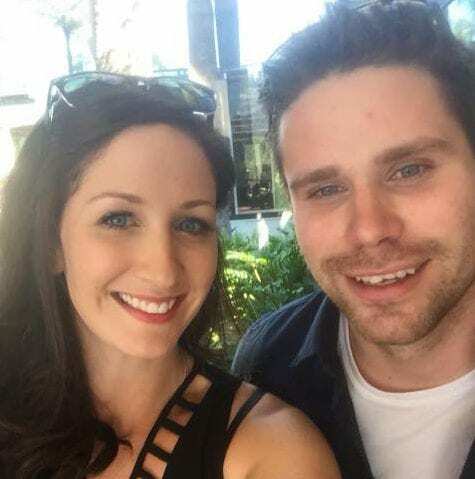 She told BBC World News, “We’d like to think most people would probably make the same choice.” Nevertheless, the world loved their story, and the couple was not going to go unnoticed and without being rewarded in some way. 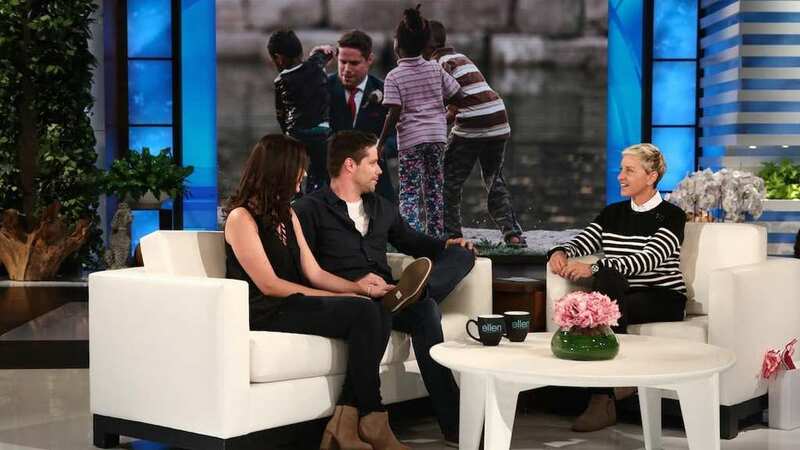 In fact, the couple were even invited onto The Ellen DeGeneres Show. Their time on the show allowed them to speak about their story and share their details about their Harry Potter themed wedding. 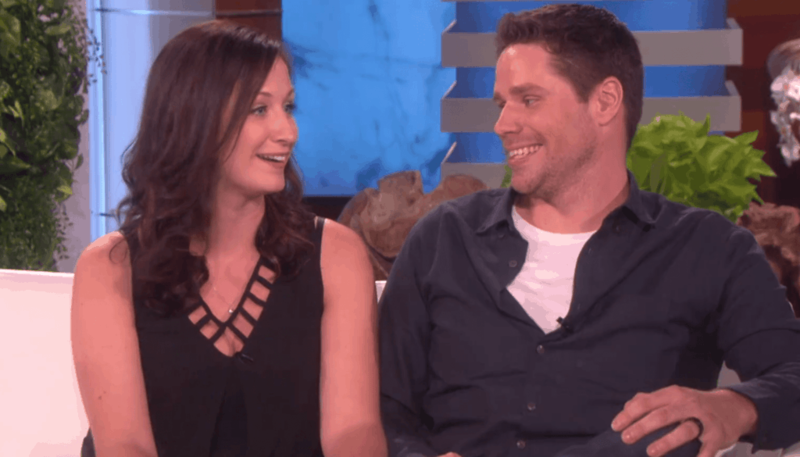 Brittany and Clayton discussed their ordeal with the drowning boy and how he then walked away without saying anything, which left comedian Ellen to respond with “Kids these days!” While the boy may not have acknowledged Clayton’s heroic actions, Ellen was sure to reward the newlyweds with more. Since Ellen rarely lets any of her guests leave empty handed, it would be no different for the newly married couple on their visit. 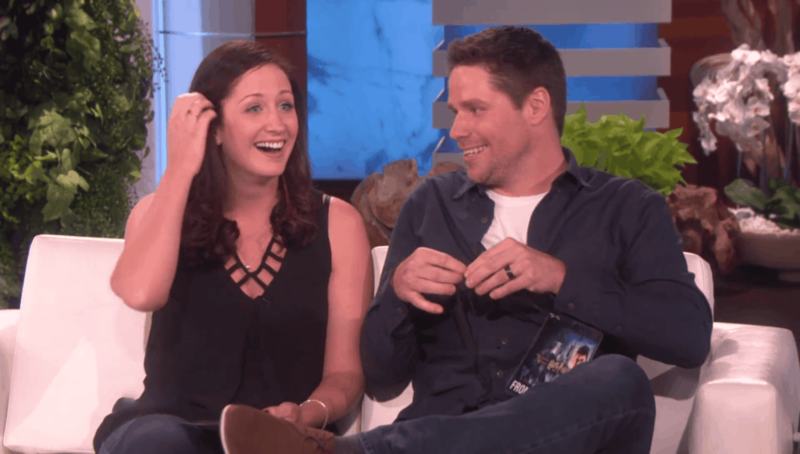 Making it clear that they were massive Harry Potter fans, Ellen was not going to pass on being given this information, and rewarded the couple with a trip to the Wizarding World of Harry Potter at Universal Studios with front-line passes. The couple was overjoyed with this treat, but of course, Ellen did not stop there. Just like Ellen wished to acknowledge the actions of the newlyweds, she also expressed how Cheerios had also been inspired by their story and wanted to treat them as well. 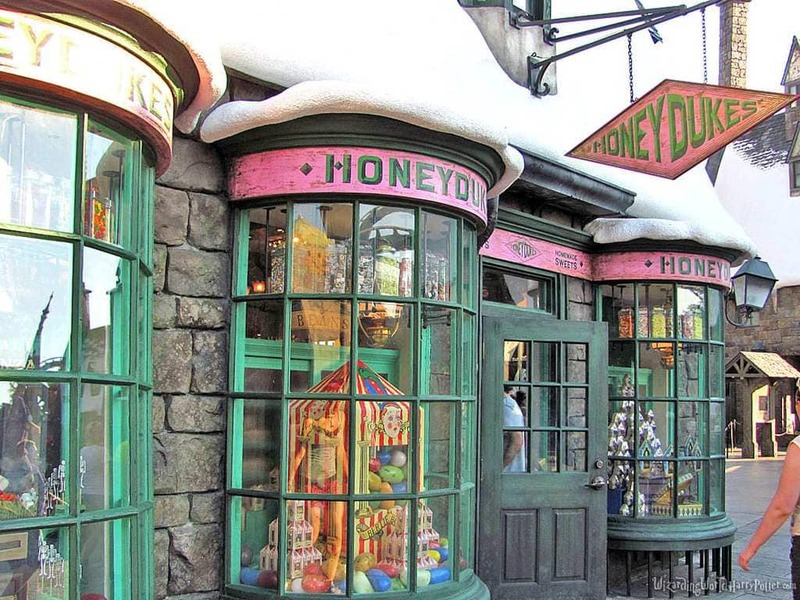 Their treat was a flight away, with a honeymoon to London to experience Harry Potter Warner Bros. Studio Tour. As the place where dreams are made of for Harry Potter fans, the couple’s reaction was nothing short of what was expected. Embracing one another in complete excitement, the couple’s dream wedding was followed by a dream honeymoon. 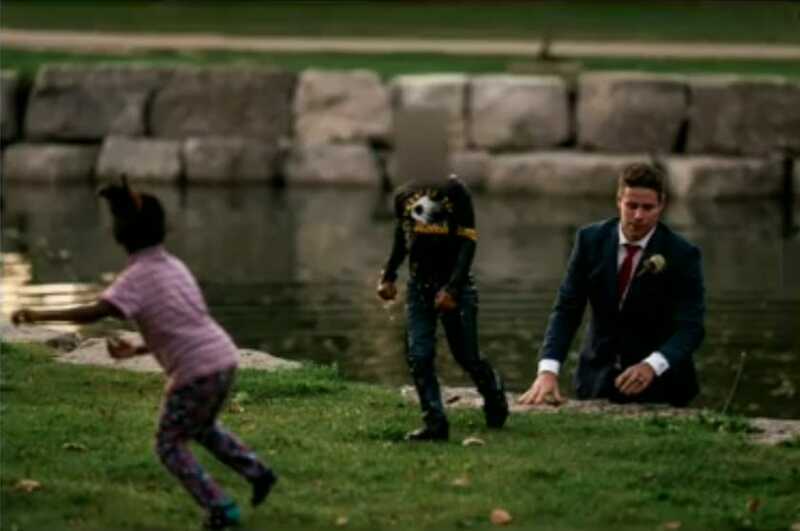 The world watched on as the happy couple was rewarded and honored for saving a young boys life, and many saw Clayton’s actions as a reflection of the kindness he will give to his new wife. The wedding may have taken a dramatic turn, but this was not going to be a reflection of the life the two would share with one another. Their humble attitudes and kindness is what also made this couple so lovable and a perfect reflection of how their relationship will be. Much like their favorite book, the life of Brittany and Clayton Cook was looking to have many exciting chapters coming their way. After completing 15 ‘chapters’ by the time they wed one another, their next chapter was to be unexpected but one of the best for the couple. 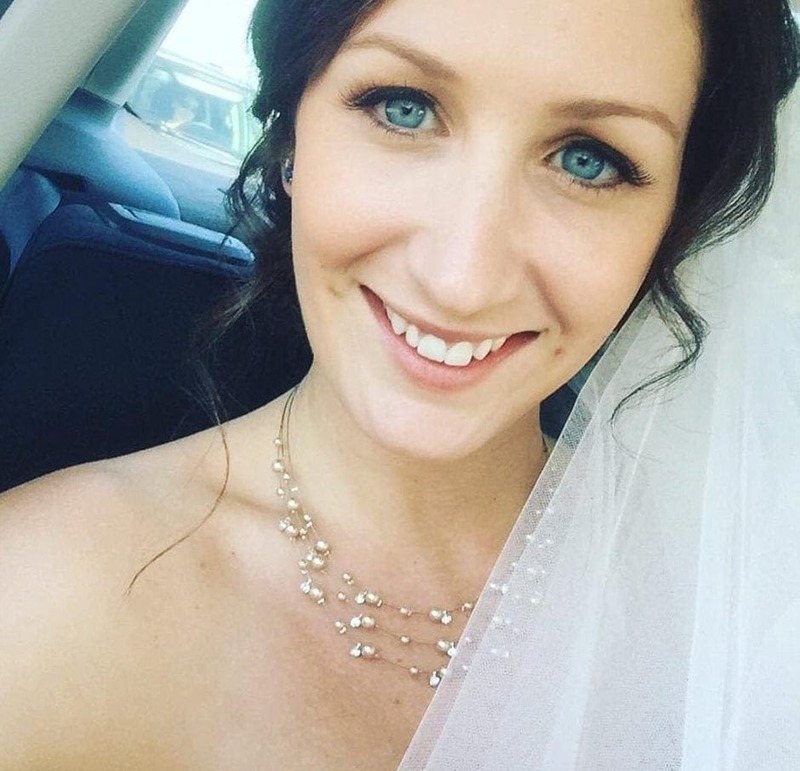 Who would have ever thought they would have been rewarded for what would happen at their own wedding, but life works in interesting ways, and you never know what could happen.